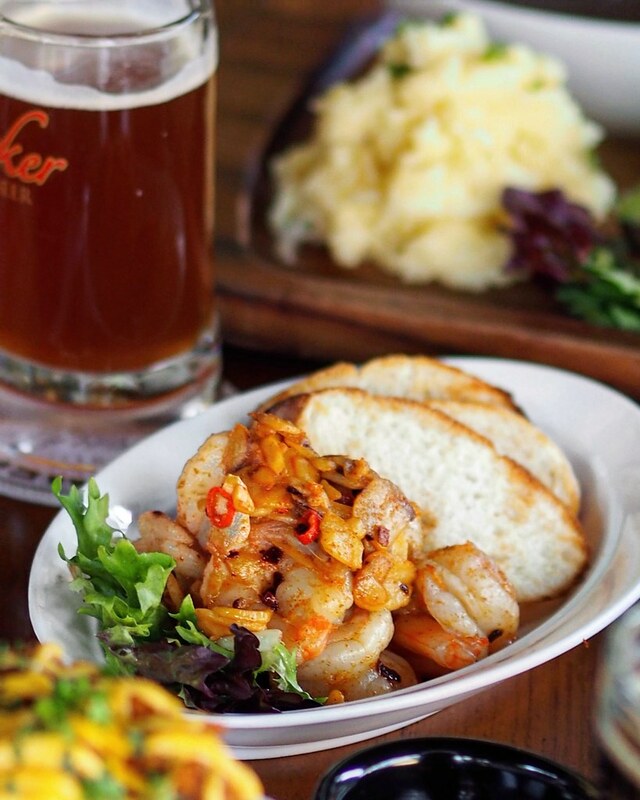 Nestled within the heart of Holland Village is Starker Signature, a casual bar serving authentic German brew, and probably one of the best authentic hotspot known for their top notch friendly staff and laid-back vibes among the multiple Starker Group outlets across the island. 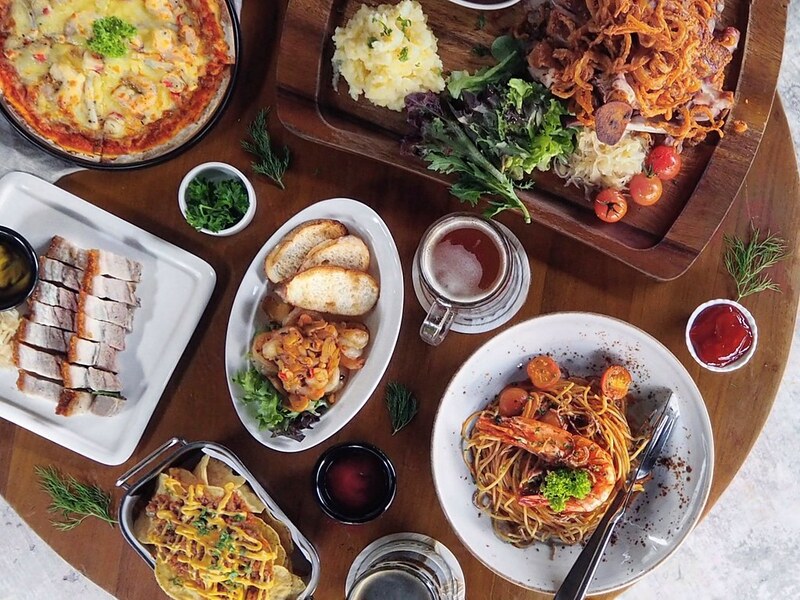 Here, it offers a variety of incredible Starker Fresh Brews with a 7 days shelf policy, and an even wider selection of food items such as their signature roasts, mains and bar grubs to complement the ice-cold beer and further accentuate the fresh brew drinking experience for their diners. The main highlight at Starker is undeniably their fresh beer - Adopting the traditional German-brewing techniques using the finest European ingredients from milling to fermentation, Starker aims to deliver unfiltered and unpasteurized quality German-style craft beer served icy cold straight from the barrel, and with a strict 7-days shelf life to guarantee absolute freshness. Starring their 5 unique brews: Lager, Dunkel, Charcoal, Aromatic and Lychee. All these award-winning beers, from the sweet Lychee to the smokier Charcoal, are freshly brewed in-house and served the traditional way for beer connoisseurs. Starker has recently launched a new beer - Ale. Brewed from specially selected caramelised malts using top fermentation, the Ale is lusciously vibrant-coloured and boasts a mild fruity aftertaste, constituting a refreshing beer with a nice crisp finish that will leave you wanting for more. Great news! 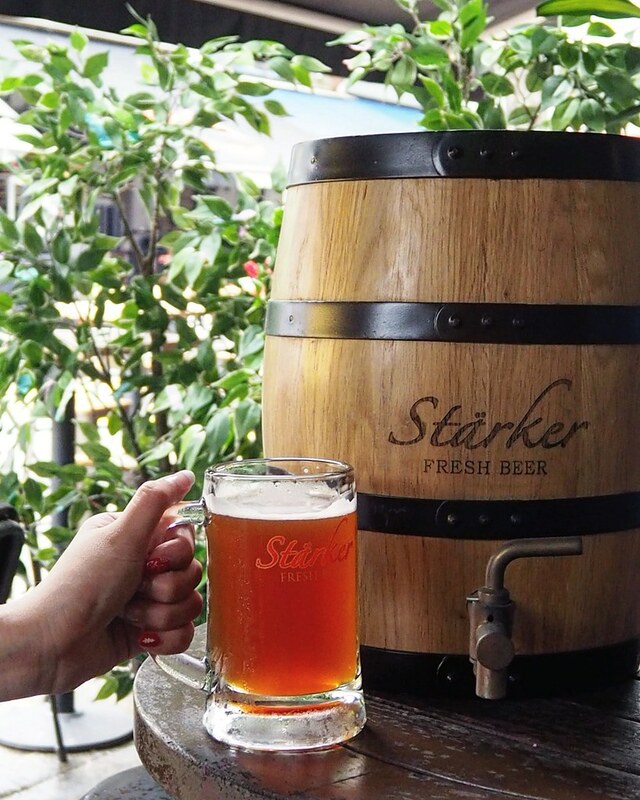 If you're looking to chill out with your loved ones this Friday, look no further as you can now settle your TGIF plans with Stärker - Starker will be giving away 600 half-pints of Ale every Friday from 6pm onwards at different Stärker outlets till 2 Feb 2018. Do note that each customer is limited to only one half-pint beer per day. 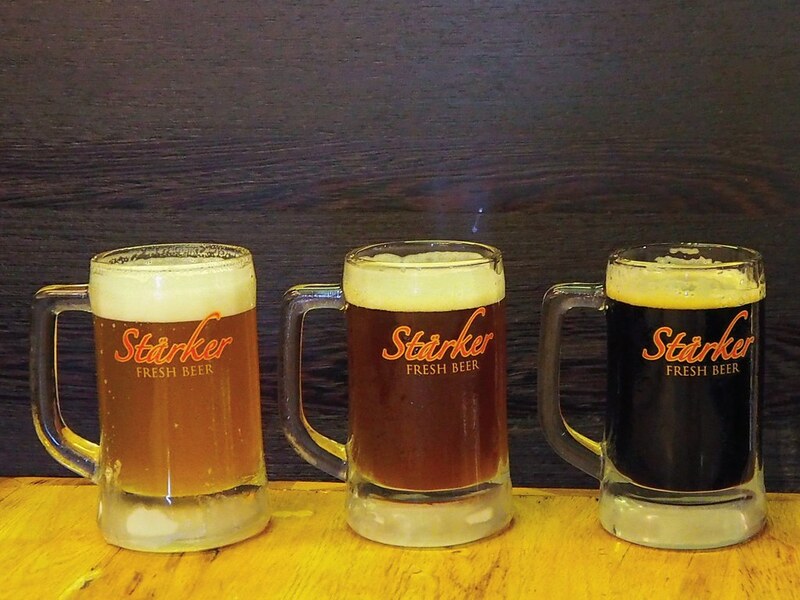 If you’re looking for some unique brews, Starker serves a pretty fancy range of fresh brew catering to the preferences of different customers. What is a trip to Starker without having a round of their renowned beer? For something lighter, go for their Starker Lychee (half-pint $8.90/one-pint $16.90/2L barrel $63.90/5L barrel $148), a medium bodied beer with a distinctive Belgium lychee fragrance. Brewed with a unique mix of wheat malts and 100% lychee extract, it is refreshingly light with a subtle fruity aftertaste and a hint of tartness. Best paired with fresh succulent seafood, salad or pasta. The Starker Charcoal (half-pint $8.90/one-pint $16.90/2L barrel $63.90/5L barrel $148) is a fuller bodied dark beer with a more intense and robust body. Brewed from crystal and dark roasted malt, it boasts an edging bitterness and leaves a distinctive aftertaste with a hint of coffee. Best paired with Starker's signature roasts or burger. 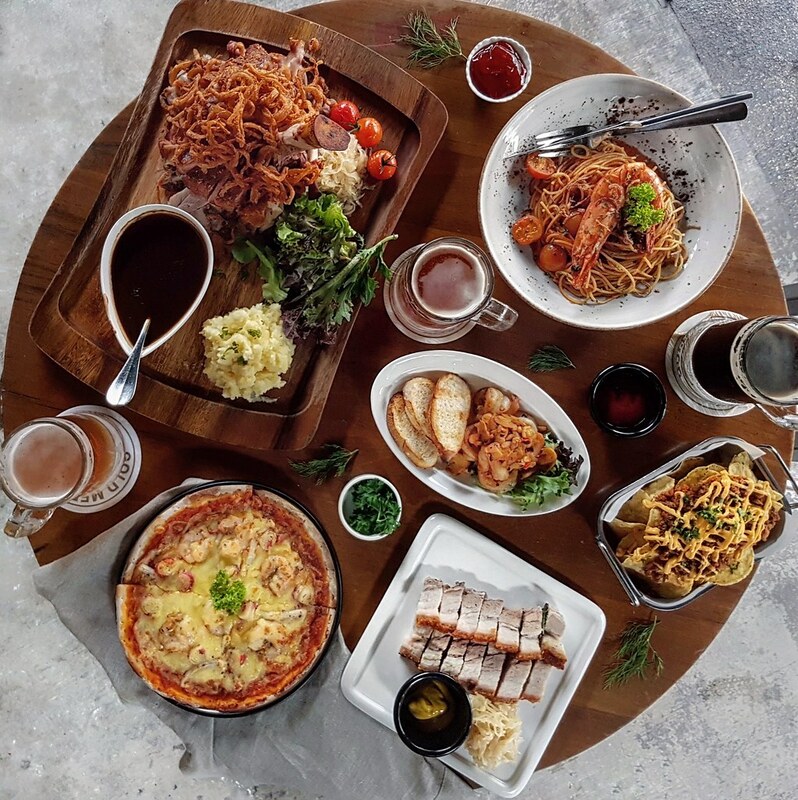 Even the best beers don't sit so well on empty stomachs, so be prepared to indulge in their extensive selection of unpretentious grubs with a beer or two in hand. 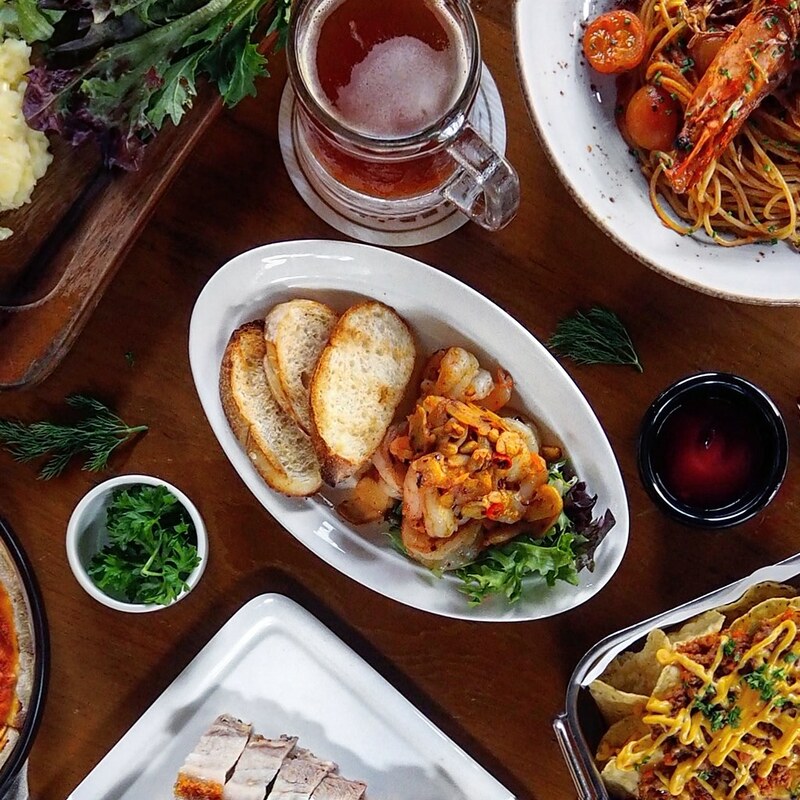 The Traditional Pork Knuckle ($38.80) features a huge portion of pork knuckles (serve 3-4 pax) marinated with Starker secret spice recipe and roasted to a perfectly crisp exterior, with tender juicy meat within that boasts a decent firmness in each bite. 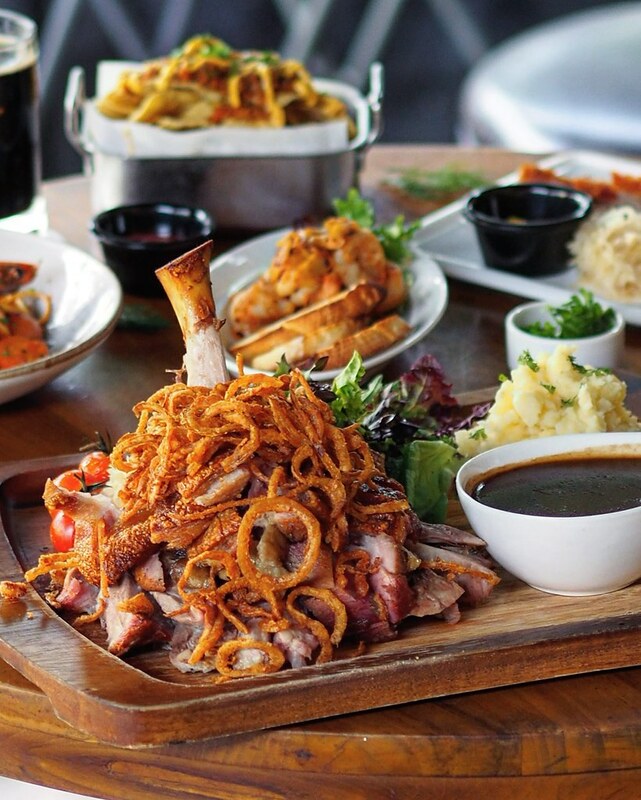 Served with a side of creamy mash, Starker beer sauce and house salad, as well as crispy freshly cut onion strips, battered and golden-fried, each of these complements contribute to the flavour and textural interplay of the dish, yet not overshadowing the perfectly executed pork knuckles. The Roasted Pork Belly ($14.80) comes in a plate of generously portioned sliced pork belly, with a half-half ratio of tender meats and fats that boasts a melt-in-the-mouth consistency, and roasted to a perfect crackling texture for its thin golden crisp outer skin layer. Served with vinegary French mustard and sourish sauerkraut (pickled cabbage) for a more flavorous addition, though the pork belly has already shone on its own. 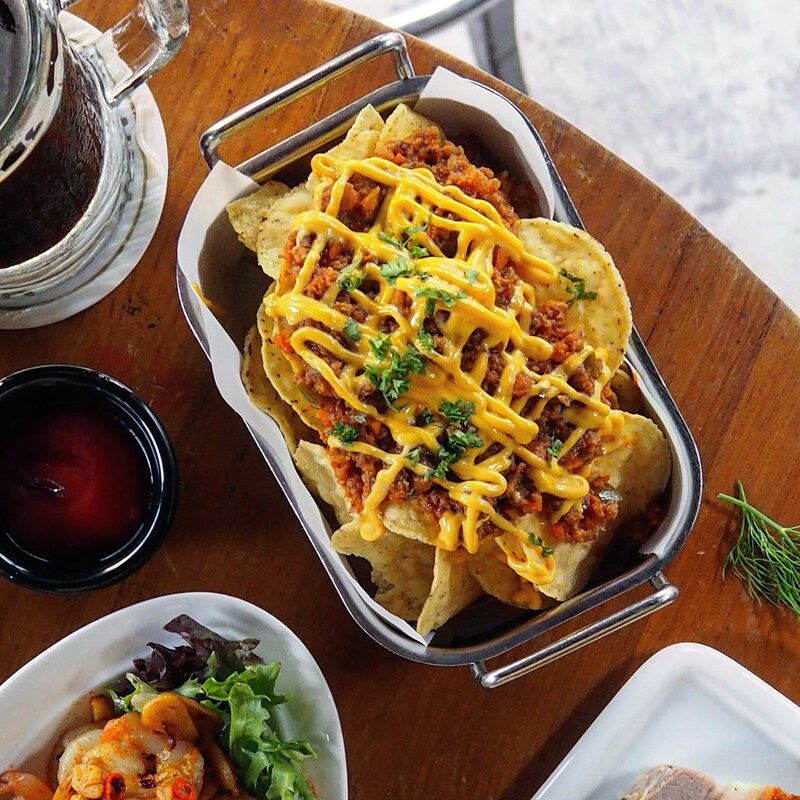 One of their upcoming new items on the menu, the Muchos Nachos comes loaded with generous servings of home-made ground beef and cheese sauce to have your crunchy Nacho Chips with. The best kind of savoury pairing for your Nachos, and the perfect finger food to go with your Starker fresh beers. The Gamabas Spanish Style is another upcoming new item on the menu. This classic Spanish tapas dish features succulent shrimps in a spicy garlicky sauce, served with toasts on the side. The shrimps, which boast a bouncy texture power packed with a great deal of juiciness in each piece stole the show. The mild spicy garlicky sauce is not too overwhelming, and provides just the right amount of flavour to the shrimps so as to not overshadow its freshness. 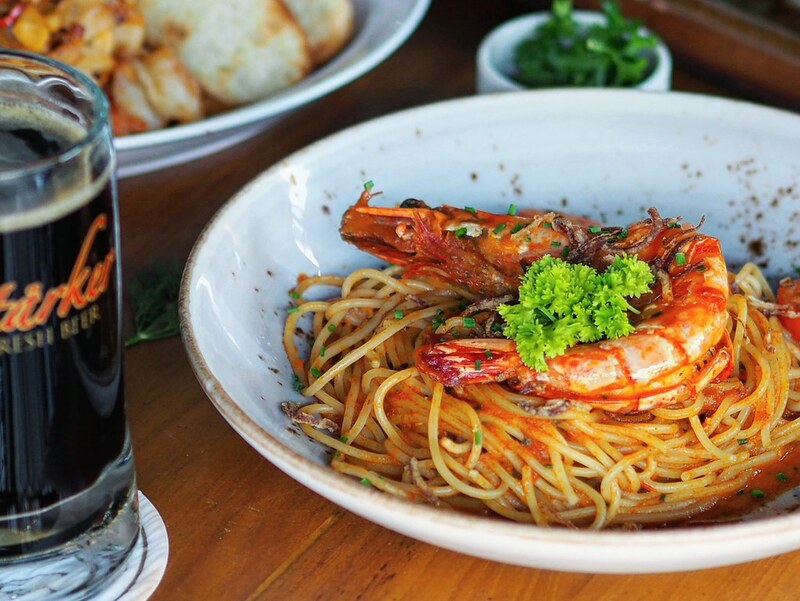 The King Prawn Pasta ($19.80) comes with a single large grilled king prawn on a bed of spaghetti. The king prawn meat is tender and succulent down to the last bite, while the spaghetti is executed excellently as well, cooked al dente and tossed in tomato sauce with a hint of crustacean sweetness due to the prawn stock used. 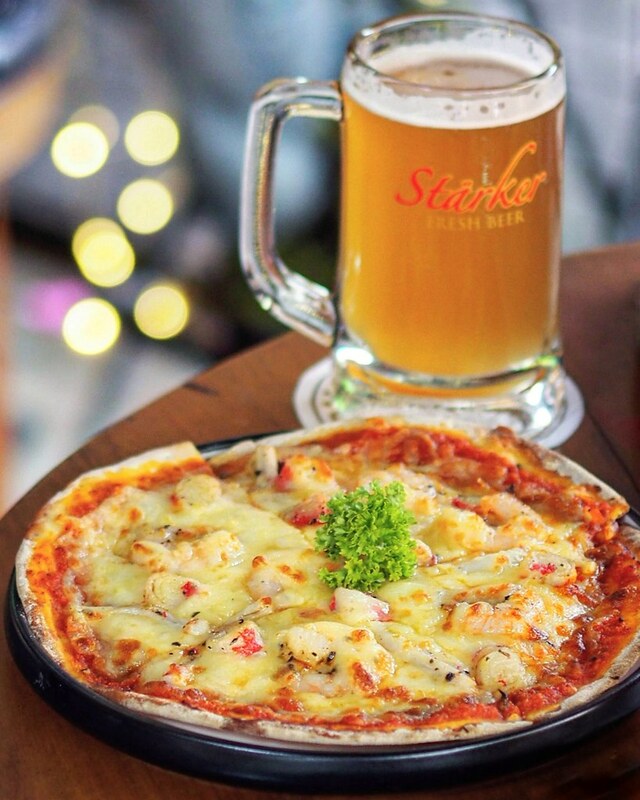 The Seafood Pizza ($10.80) features a home-made crispy thin crust pizza topped with copious amounts of prawns, squids and crab meats marinated with garlic and herbs. The assortment of seafood toppings are juicy and fresh with a subtle herb aroma, while the blanket of generous mozzarella cheese on top balances the tangy tomato base. 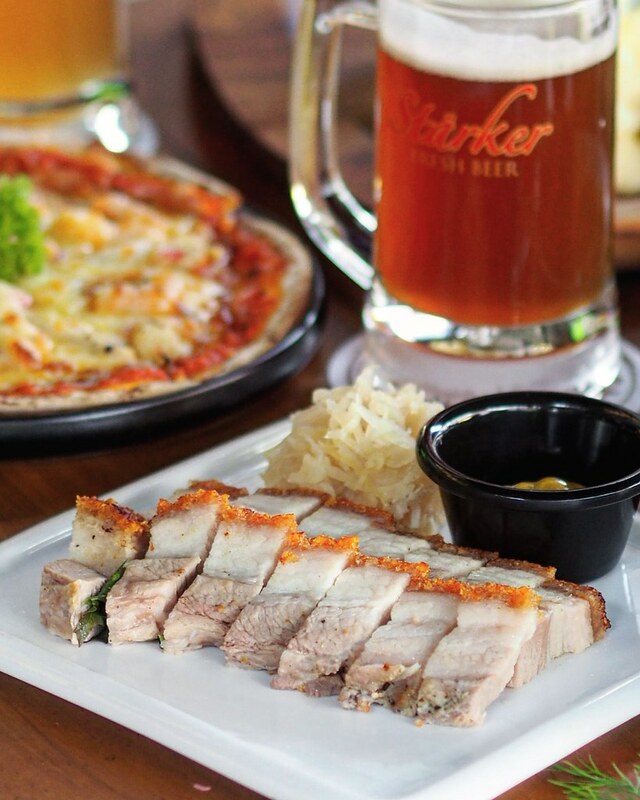 Reviving the old world style of beer drinking with their authentic German-style fresh brews, and bringing to the table such quality food pegged at affordable prices, Stärker is fast becoming the hip joint to be in the neighbourhood. So before the place gets even buzzier, make your way down soon for a relaxing night over some beer and food with your loved ones. 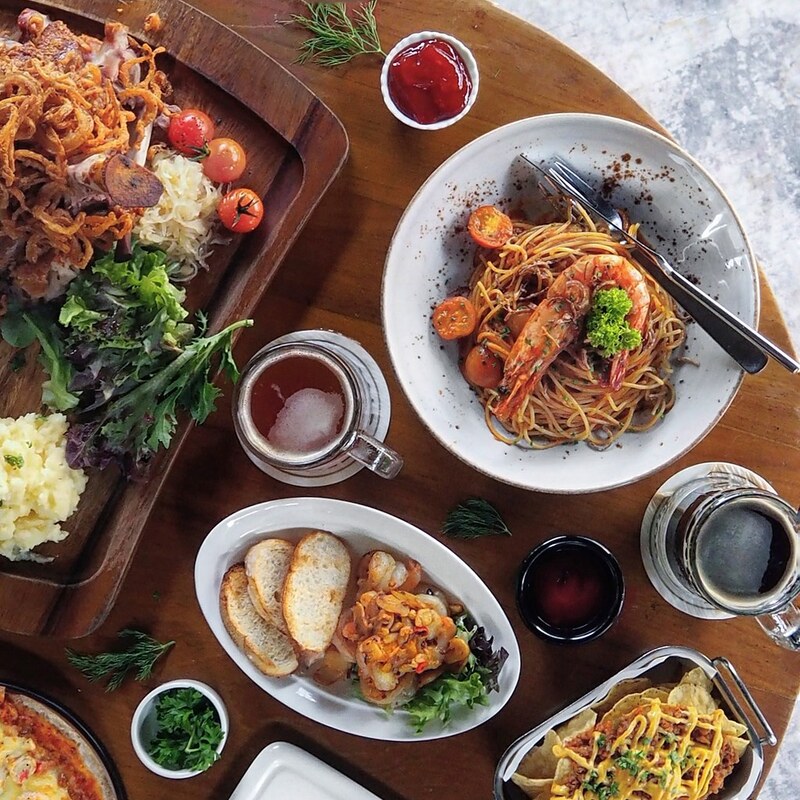 Make sure to enjoy their half-pint giveaways which will be happening every Fridays at stipulated outlets till 2 Feb 2018 too!